Veiled Strike: Slash an enemy, dealing [6149 / 6215 / 6284 / 6352] Magic Damage. Attacking with Veiled Strike while Sneaking or invisible stuns the enemy for 4 seconds and sets them Off Balance for 5 seconds. Surprise Attack: Cost: 2295 Stamina. Concealed Weapon: Slash an enemy, dealing 6354 Magic Damage. Attacking with Concealed Weapon while Sneaking or invisible stuns the enemy for 4 seconds and sets them Off Balance for 5 seconds. While slotted, your Movement Speed while Sneaking or invisible is increased by [22 / 23 / 24 / 25]%. Veiled Strike deals Magic Damage to a single opponent, and causes them to become off balanced and stunned if you are invisible or in stealth mode. Its range is slightly greater than that of a melee attack, affording you a better chance of getting the stealth bonus without being detected. The Concealed Weapon morph increases your movement speed while stealthed or invisible, giving you an even greater chance of getting close enough without being seen. Alternatively, the Surprise Attack morph changes it to a Stamina cost, deals Physical Damage, and will reduce the enemy's armor, causing your subsequent attacks to do more damage. 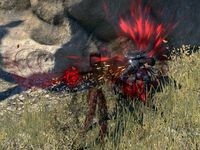 As a stealth-based skill, it may be difficult to use while you are in a group or in an area where there are other players around, as many players tend to charge in and spoil the surprise. One way to counteract that is to use abilities such as Shadow Cloak or Consuming Darkness that can grant invisibility, allowing you to get the full benefit from Veiled Strike. You can also craft potions to give yourself the invisibility effect. Concealed Weapon is a good morph for mobility. When combined with Dark Stalker, Shadow Cloak, and Cripple (on a target) it becomes a great escape maneuver. Concealed Weapon is a recommended morph for the Nightblade Initiate build, while Surprise Attack is recommended for Umbral Assassin. Concealed Weapon: Your stealthed movement speed bonus is no longer removed if another player character casts Shadow Cloak while stealthed. This ability will no longer stun and off-balance enemies who dodge the attack. Concealed Weapon: The stealth speed bonus from this ability now persists if you weapon swap twice. Veiled Strike and its associated morphs will no longer stun enemies or cause them to go off-balance if they dodge the initial attack. Surprise Attack: This morph is now a stamina-based ability, now applies the Major Fracture debuff, and will no longer reduce your target's armor if they dodge the initial attack. Fixed an issue where this ability was not playing the correct audio during impacts. Fixed an issue where this ability and its morphs would still stun and set an enemy Off Balance even if they could detect you with detection potions.